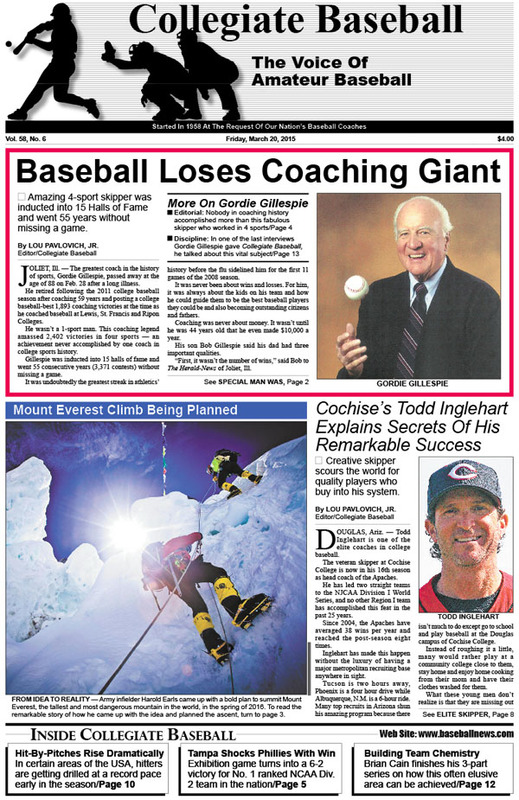 • Huge Coaching Loss: Gordie Gillespie, who amassed 2,402 victories in 4 sports (including 1,893 baseball coaching wins) passes away at age 88 after a long illness. • Incredible Success: Todd Inglehart of Cochise College in Arizona is one of the elite coaches in baseball with a system that is hard to beat. • Mount Everest Climb: Army infielder Harold Earls came up with a bold plan to summit the tallest and most dangerous mountain in the world in the spring of 2016. • Still A Big Problem: Hit by pitches rise dramatically in certain areas of the nation as hitters get drilled at record pace. • Tampa Beats Phillies: NCAA Division II power stuns Major League team with 6-2 victory. • Editorial: Gordie Gillespie saved many kids during remarkable coaching career. • Phantom Infield Drill: Nobody did it better than 1977 Cal. St. Los Angeles Diablo ball club that qualified for College World Series. • Ruleball With Rich Marazzi: Line drives can cause runners fits with tag plays. • Charlie Greene Column: Instruct in the language of your players. • Junior College Notes: Dramatic homer in 14th inning gives Folsom victory. • Louisville Slugger National Players Of Week: 10 players put up extraordinary numbers, including one pitcher with 18 strikeouts and a hitter with 4 homers. • NCAA Division I Notes: Louisiana Lafayette skipper Tony Robichaux celebrates 1,000th win of career. • Brian Cain Column: Team building plan essential to having chemistry within ball club. • NCAA Division 3 Notes: Duo of wild games result in 62 runs, 9 home runs. • Gillespie On Discipline: In one of his last interviews with Collegiate Baseball, Gordie Gillespie explains this vital topic. • NAIA Notes: Belhaven’s Joey Harris throws no-hitter in collegiate debut. • Collegiate Baseball’s High School National Poll: No. 1 College Park H.S. (Pleasant Hill, Calif.) features seven seniors who have signed with NCAA Division I universities. • High School Notes: Summerville (S.C.) High School wins 25th International Paper Classic unbeaten. To purchase the March 20, 2015 edition of Collegiate Baseball, CLICK HERE.